This is the story of Ekananga and her reason for being here in India. I never wanted to go to India, I was always scared of India. I always said that I never go to India, that I want to go to America. When I was a teenager in the the Seventies, India was very fashionable for the Hippies. I was dreaming to be a part of the Hippies, but I thought: “When I go to India, I will going to die in India.” Actually, nobody was asking me, to go to India. I’m from Germany. As a child I was very unhappy, living in a unhappy family. My family comes from the Czechoslovakia. They were expelled from their country because of the war and later they fled from East Germany to West Germany.. They were traumatized and I was growing up in a atmosphere of permanent despair, sadness and frustration. My family was not able to integrate in the western society and so, even I was born in Westgermany grew up like a foreigner, not even able to understand the common dialect there. I grew up as a refuge child, even I was born there. When I was two, I developed a serious illness called leukemia and I spend a lots of time in a Hospital or at home in bed. I was very skinny, very weak and full of pain. Miraculously, I overcame the disease at the age of four and a half and I could go to school in the age of five. As a teenager, already in that time influenced by movies, I was convinced that happiness and „true life“, I will find in all the illustrious places, I knew from TV, like Nice, Cannes, New York, London etc. the same time I saw myself as a cowboy, riding in the Wild West. So, with the years I visited one by one all the famous places. But where was the Happiness, when I was in Front of the famous Casino in Monte Carlo or Empire State Building, or in Hollywood, or in the Island of the South seas, staring at the so called “beaches of Dreams”. Each time being in one of these well-known places I expected that it will be exceptionally. The life continued like this and I still felt empty in it, sad and lonely. I sat on many very beautiful and famous beaches. I saw whales and dolphins. I traveled through Australia and around it. I remember this huge, wonderful cliffs at the seaside on the Southcoast … So I had many experiences of this kind. It dawned on me gradually, that there is a serious mistake in my perception of reality. “My life will change when I change the country and places.” It does not work like that. My mind, my way of thinking, my fears, my memories, my loneliness are always with me! And that if I do not change my view, my perception and knowledge about the world, I will still create the same suffering, because karma is our mind. I will always choose the same friends and do the same stupidity, because I am still the same person.Wherever I am, I always create the same environment, because my mind is the source of Unhappyness, nothing else. But how can I change my mind and how can I find the remedy for my sadness in life? So, after a failed try of a relationship with a man (of couse, it was another attempt of gaining happiness and sense in life) in Germany, again I wanted to find out about the truth.I went to Australia again, I was 40 years old. I left my friends and I abandoned everything. I went to Sidney, bought a camping car and drove off for 6 months with this vow, not to make any connections to people and not to talk to anyone. I truly wanted to find out about myself, without getting influenced from anybody. Once in the morning, when I was very miserable, I realized, that there is nobody to blame for it. There was ovious no reason outside for my mood, there was only my own distracted mind. But after I realized many times this cause of suffering, where is the remedy, how can I change? I still didn’t know. Finally I found in Queensland, Australia a Buddhist Center and the first time I could hear about the nature of the human mind, about the illusion regarding the world and ourself. Anyway, I startet to practice Meditation, I felt deeply happy, there was a place, made for me… I thought. But again I was so angry that I had to give up all my hopes. And I remember that the next day, a few months after my arrival in Berlin, I was sitting in my new apartment and I was asking, deep down to myself – Tell me the true meaning of my life, tell me! – And I had a vision. I saw a white house somewhere in India – between north and south. But I said to myself – “This is not the answer for me, because I do not understand it. You are not taking me seriously.” I din’t know, who I was talking to. A few years later I recieved the same answer for my question. I went to the Mystic. He is Indian and today may gurudeva. I told him, that I can see things happen to people in the future and I don’t know what to do with my life. So, my gurudeva, my teacher, is teaching me, the meaning of spiritual life, how to lead it and also to understand how to deal and live in peace with this ability to forsee things. It is very important to understand, that this ability to see the future is highly overrated and only a little insignificant side-effect in spiritual life. Shortly after I met the Mystic, my gurudev, I went with him and a group of people the first time to India. In that time I considered myself still of being a Buddhist, someone who has no believe in God, who has no believe in a higher authority. But that changed with that first trip to India. In that time we visited Ekacakra, a holy place in Westbengal and I had the first time a experience in a holy temple. 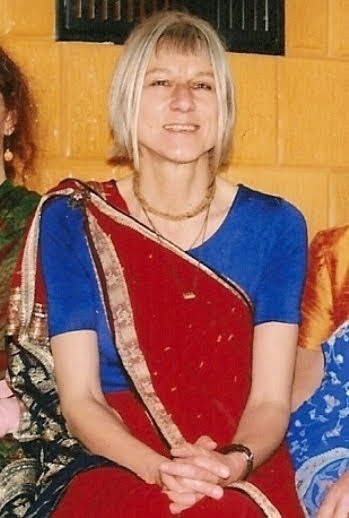 Back in Berlin I was working for the Mystic, that means organizing his lectures and and counselings, more and more I got involved in the vedic knowledge, the vedic knowledge about god. He initiated me, that means I am his disciple, he gave me a mantra and sent me finally to India. He said, there is nothing for me in the western world. In that time I was 54 years old and he told me to stop working and go. So I did, now I receive a little pension because of my damaged health I got from the work as nurse and I can live from that very simple in India. There a three places of pilgrimage I am staying. There is Jagannatha Puri in Orissa, the Residence of Jagannatha, the Lord of the Universe and a Incarnation of Lord Krsna. There is Vrndavana in Uttar Pradesh, the Birthplace of Lord Krsna, many devotees are there and Maypura, the birthplace of Caitanya Mahaprabhu, the Incarnation of Lord Krsna, 500 years ago. So finally, my focus in life is shifted from the outer circumstances (Aahh – Empire State Building, aah – Buckingham Palace) to the inner relationships I can have with the holy places and the holy people there. To connect with a holy place is like connect to the true nature we have in ourself. Today, I consider myself to be a sannyasi, even as a woman. A sannyasi is someone, who is in the order of renunciation. He has no home, no family life and no material interests, but he follows a guru-parampara: one guru is teaching the disciple, disciple will be guru and teaches on, since times immortal. The knowledge will be delivered like this out from ancient times until to today. It is very rare that someone is right from the beginning of life a sannyasi. Normaly it starts to be a Brahmacari (a student), after he will be a ghrasta (a married householder) and in the end, when he fulfilled his duty, normally in the age around fifty, he will take vanaprastha. That means he will separate from family and all material chains and taking sannyasa to prepare for death, in the last years, he hast to live. I am now sixty years old. My journey comes almost to an end. To end suffering is also to accept the suffering, to accept the past and the own mistakes and failures as a part of the life long learning process and to keep going. The world is a place of suffering, that is a matter of fact. It is a waste of time to try to avoid it. We cannot. But we can transform the suffering and to see the chance within, to find the truth and we must understand that suffering is not external is internal, is our distracted mind. Nothing else. The world is actually neutral, but we are creating a battlefield. Our mind creates a battlefield. The big question is now: Did I find happiness and the truth? Could I change my mind? The answer is: I am still in progress, but now I found the direction. Sometimes I go backwards in old bad habits, sometimes I can go a little forward. Well, I guess there are around 20 years to go for me, we will see, how far I will come. It is also very important to stop blaming anyone, for the own misery. There is nobody to blame at. But without asking for help it is also impossible to change. I hope I could make myself clear, please send questions anytime. If you like, you can write in the webside, if people have questions about this, maybe you can refer them to me and I will try to answer everything, I know. This subject of spiritual life is very big and it is impossible to explain everything in a small story. The feature photo (up the page) in this story picture the oil painting of Ekananga entitled “Die Raise” what means “The Travel”. The photo depicts the author in the moment of her initiation. Feel also free to comment the story on line or post any questions. The Author is happy to interact and answer the questions.